In between a hike to Black Sand Beach and playing with the magnetic sand and soft waters of the Caribbean Sea, and witnessing the incredible dinoflagellate algae in Bioluminescent Bay shine so intensely it was like experiencing a snowglobe under the surface of the water, we stopped at Bananas Beach Bar & Grill for a family dinner in the setting sun. 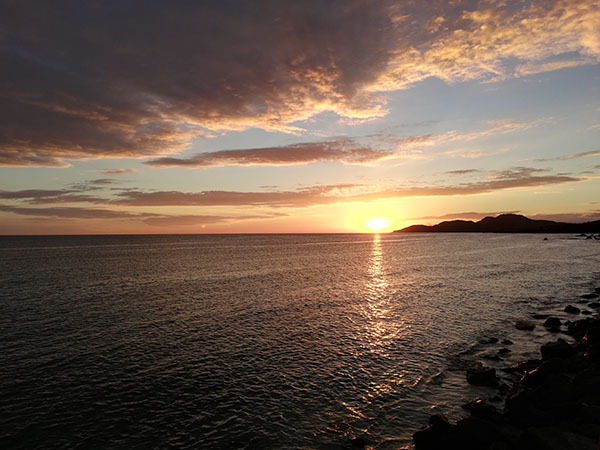 The worst mistake we made during our trip to Puerto Rico was planning just one day on the island of Vieques. This little 52 square foot island could fill 52 days of leisure, excitement, fun and even sprinkle in a little bit of magic during your stay. And still, that might not be enough time to enjoy everything on the island. 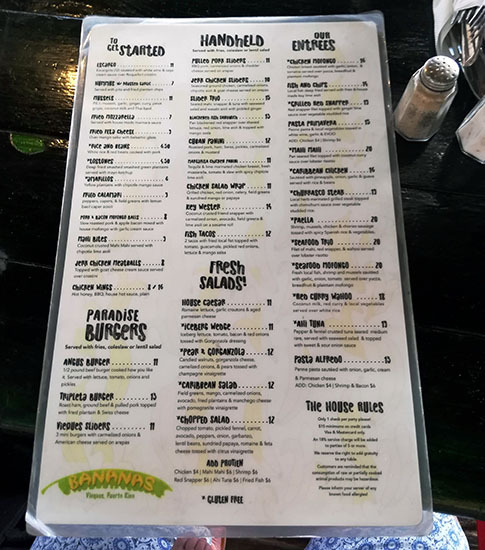 Bananas Beach Bar & Grill is located on Calle Flamboyan – an esplanade on the south side of the island in Esperanza along the waterfront. This locale is filled with miles of beautiful beaches, some ruins and a few restaurants and stores littered in between. It’s the primary meeting point for many Bioluminescent Bay tours, and precisely the reason why we found ourselves here. 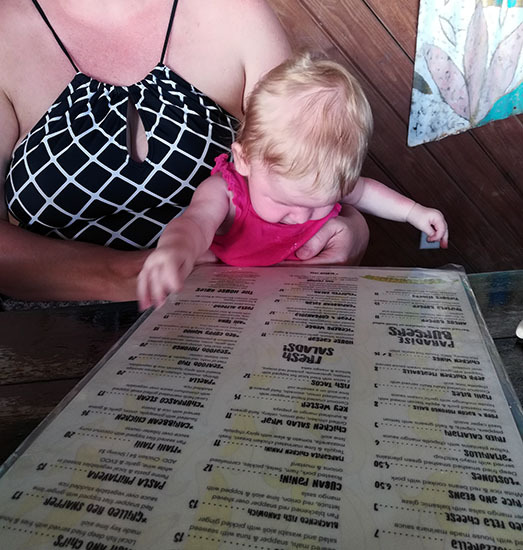 She was so enthralled with the menu and kept pointing at everything. The kids thought it was so funny and wanted to order everything she pointed at. 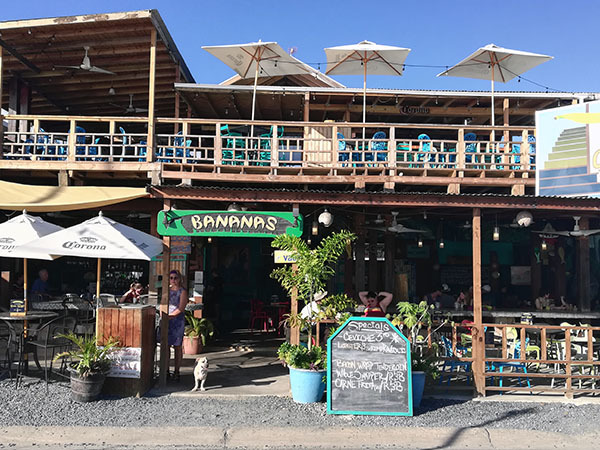 Perfect for the climate and breezy island temperament, Bananas Beach Bar and Grill is an open air restaurant with wooden tables, bright teal decorations, dog friendly, and casual. A walk across the street will put you directly on the beach, and if you time it right, views of a beautiful and surreal sunset. The restaurant is on the ground floor of the accompanying guesthouse, offering cabana style rooms without television or phone lending once again to the idea of succumbing to the island life. For dinner, our family started with the Mahi bites. 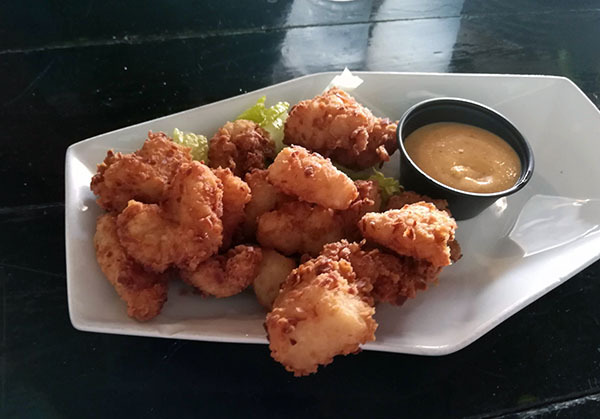 These coconut crusted deep fried fish bites were a generous size considering they were an appetizer and came with a chipotle lime aioli sauce. Even still, were gone before they hit the table. An afternoon spent hiking through the jungle and swimming in the ocean made for some ravenous kids. I secretly wanted the fish tacos, but when Widmore decided that was what he wanted I relented and ordered the Seafood trio instead. In the end he decided to share and we both were happy with our selections. 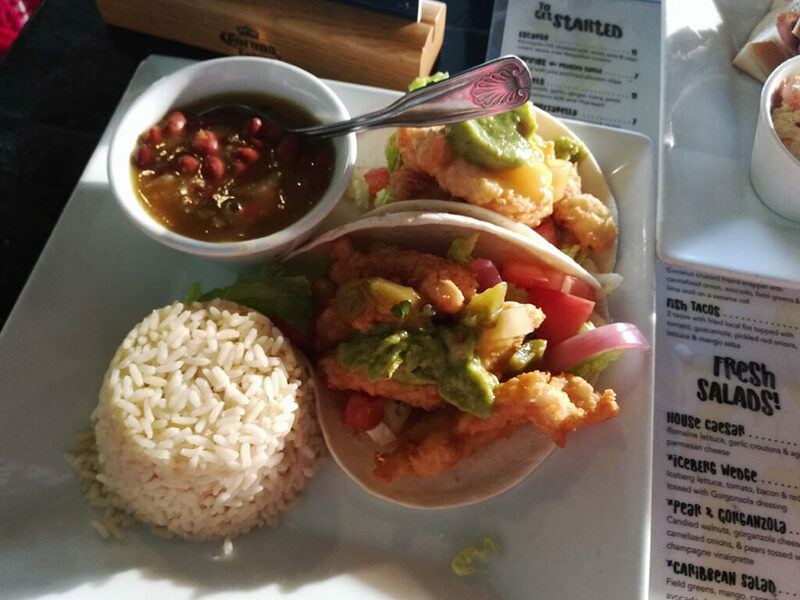 The fish tacos come with the local caught fish of the day, but are made complete with the fresh mango salsa paired with guacamole. Nothing else mattered. They offer the perfect blend of sweet, spicy and salty. 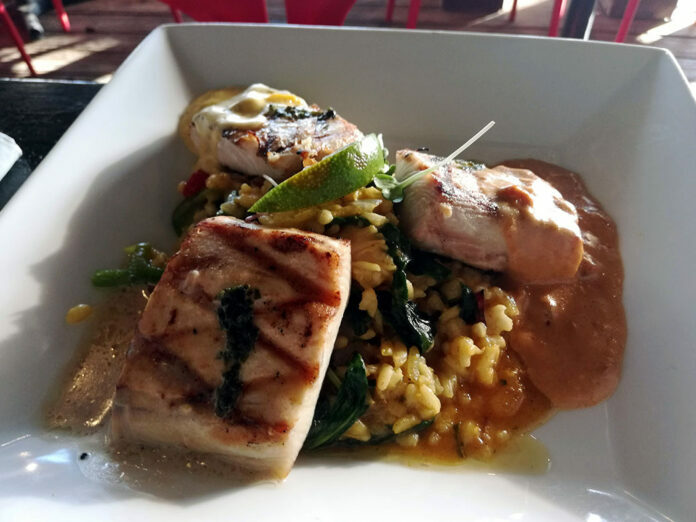 The seafood trio comes with mahi, snapper and wahoo, but is also served with a lobster risotto that is better than any of the three fish selections (see main photo). It is a large meal that all three children could easily share. 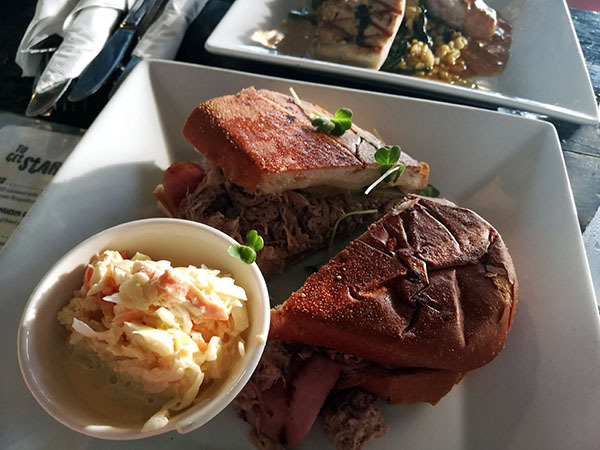 Gabriel indulged in the cuban panini that comes with roasted pork and ham, and is topped with swiss cheese, pickles, and caramelized onions. The pork and ham are spiced perfectly, sweet with a hint of cumin and pickles for zest. 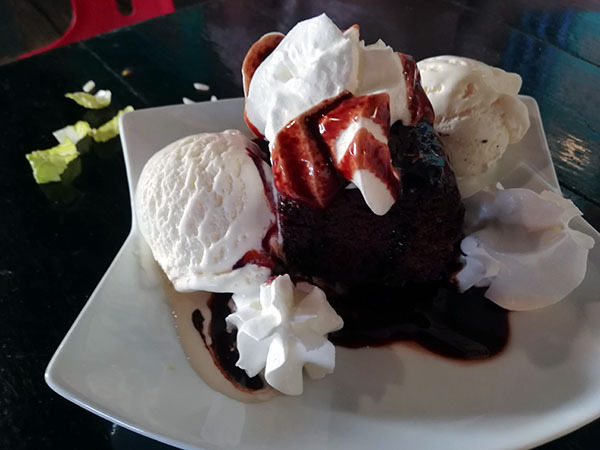 ► For Kids: Bananas Beach Bar and Grill is a great family friendly restaurant with selections everyone will love and an island vibe that makes all ages feel comfortable. We even saved room for dessert and the kids loved the fresh baked brownies and key lime pie. Have you been to the island of Vieques? Or Culebra to the Northeast? What was your favorite place to eat? 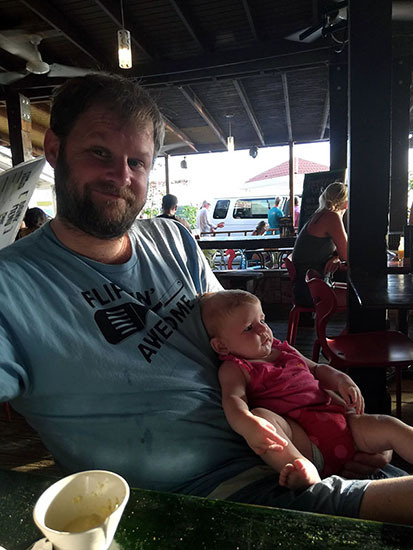 ► Nap-Time Version: Bananas Beach Bar and Grill gets our family pick for where to eat before your Bioluminescent Bay tour with Abe’s Snorkeling and Bio Bay Tours on the island of Vieques in Puerto Rico. Check out our full list of family fun activities in Puerto Rico, and elsewhere in the Caribbean!